Milestones are worthy of recognition and for DriveAway Holidays, their ten-year partnership with TravelManagers is something to celebrate. DriveAway recently awarded TravelManagers a Partnership Award to commemorate a decade partnership and recognising the significant sales contribution of well above average year on year growth made by TravelManagers, over the past ten years. Nathan Baber, DriveAway’s National Industry Sales Manager reflects on the TravelManagers relationship as being a true partnership developed over the years. “TravelManagers has always been a terrific partner to work with over the years and it really feels like a partnership where we are both in it together with the entire team, in particular Tanyu Cilek and Sandra Reucker being fantastic to work with and really accommodating DriveAway Holidays’ needs throughout the years”. TravelManagers’ Executive General Manager Michael Gazal supports Baber’s true partnership philosophy. In 2016 TravelManagers transitioned to a combined agreement with DriveAway which included both TravelManagers Australia and House of Travel NZ. 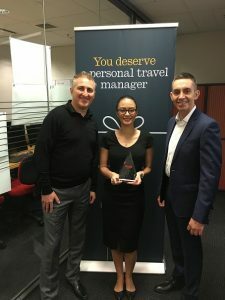 TravelManagers Australasian dominance continues to grow with DriveAway also recognizing its sister company House of Travel’s partner relationship, also presenting the company with a ten-year partnership award. “Through our combined partnership with the House of Travel Group in New Zealand, TravelManagers has an enviable distribution network throughout Australasia resulting in substantial buying power and competitive advantage. Our exceptional, strong and effective regional relationships with DriveAway and our other key airline, cruise and international partner suppliers is it no surprise that our combined sales volumes are close to AU$1.5 billion,” says Gazal.